The diagram on the left shows the orbitals in order of increasing energy. 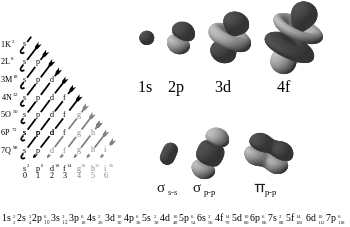 The diagram on the top right shows the four types of orbitals: 1s, 2p, 3d, and 4f. An electron configuration is the arrangement of electrons within an atom. The electron configuration describes where the electrons are inside orbitals. The structure of the Periodic table of elements is partly based on electron configuration. There are four kinds of electron configurations: s, p, d, and f orbitals. S orbitals are roughly sphere-shaped, p orbitals are shaped like a dumbbell, d orbitals are usually shaped like a four-leaf clover, and f orbitals form a mathematically complex shape. An atom can have more than one orbital; in fact, all except hydrogen do. Similarly, atoms can have more than one of each kind of orbital. The electron configurations fill up with electrons in an unchanging order. This page was last changed on 13 April 2019, at 04:28.